Of the lead-in tracks from talisman Brown’s first solo record in nine years, ‘Black Roses’ has ensured that this review is as much about the demise of The Stone Roses. Barrington Levy’s reggae standard is covered in the cheeky and danceable style we expect from King Monkey leaving little to read between the lines, the “black roses are growing in my garden” refrain more than a little provocative. Previous release ‘First World Problems’ (also about Stone Roses guitarist John Squire or drummer Reni depending who you ask) seemed stylistically to be a continuation of the parent band’s limp ‘All For One’ and ‘Beautiful Thing’ efforts as they continued to whore themselves around the world for unfathomable amounts of money. The track’s interesting mellotron intro soon tails off into a repetitive shuffle as Brown tries to rhyme “again” with “problems” in a slightly ham-fisted chorus and at the end of the video he even throws Squire’s pink Strat into the Manchester Ship Canal. So, no love lost there then. Again. Not to snipe though because ‘From Chaos To Harmony’ and the title track followed while the rest of Ripples is a welcome return to solo-form after the lukewarm reception of 2009’s My Way perhaps expedited the Roses’ return. Style-wise not much has changed; nuanced hip hop but lighter on the beats and even looser and more languid in sound than we’ve heard before from the usually laidback singer. The title track is an extension of this trademark sound taking in ‘Intergalactic‘ era Beastie Boys (in fact a bit more of the rapping we heard at some of the Roses’ later shows wouldn’t have gone amiss) but with the sort of triumphant vocal runs (“it’s not for glory, nor for riches, or for honours that I sing, but to sing a song of freedom, sing a song we all can sing”) and return to the bravado we expect from a newly invigorated Brown. In fact the loose funk of ‘The Dream And The Dreamer’ sees the frontman in full relaxed mode and about as detached from Squire’s patriarchal guitar work as possible, but without swamping the track in vocals, allowing the less-is-more musical paradigm he favours to express itself. Elsewhere, and throughout, there are also nods to his beloved Northern Soul and some lo-fi Money Mark-like breaks (again, that Beastie Boys influence). ‘It’s Raining Diamonds’ is similar in its profound simplicity; off-beats, samples, structurally progressive but with a psychedelic planetary theme and is the sort of reliable sonic experimenting we expect and far superior to latter day Roses. And again, ‘Blue Sky Day’ is minimally jazzy, confident enough to let his singing to be the centre of attention but not overly so, and lyrically the chemtrails and geo-engineering conspiracy theories are more classic Brown. Of course there is the odd stinker. 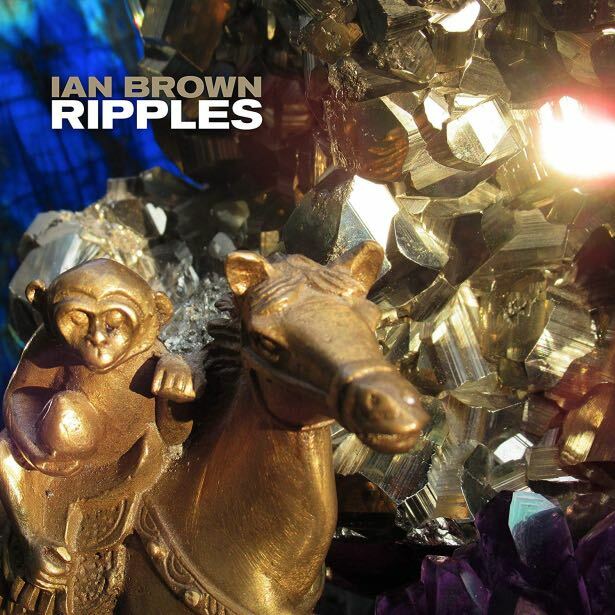 The less said about closer ‘Break Down The Walls (Warm Up Jam)’ the better but Ian Brown’s heart has always been in the right place and many will argue Ripples is his best solo collection to date. Ripples is released on Feb 1st through Virgin EMI.